Good morning! It’s a beautiful fall day here, the sun is shining, and the leaves are…well, most of the leaves are gone, but the ones that are still there are gorgeous shades of gold, orange, and red. It’s a perfect day for curling up in the sun room with a hot cup of coffee and a book. Alas! It’s still a work day and it’s nose to the grindstone for me. Today’s sunset illusion came to me from Ruben via the Might Optical Illusions Facebook page. (Thanks, Ruben!) It’s obvious that it looks like a smiley face, but it also really reminded e of a Jack-o-lantern. What do you think? Does this sunset illusion remind you of a Jack-o-lantern too? I think I see a Jack-o-lantern sunset illusion because of the glow of the sun. It looks the glow of a candle in a carved pumpkin. Or maybe to me it’s a Jack-o-lantern sunset illusion because my family and I just carved our pumpkins for Halloween. Who knows? Either way, it’s pretty neat! 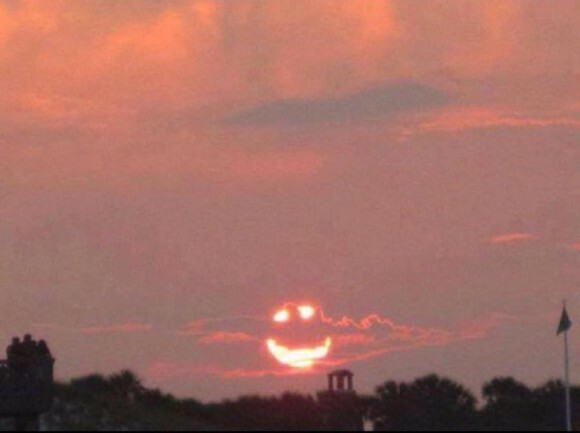 If you liked this Jack-o-lantern sunset illusion, head over and try to spot the hidden face in this sunset illusion!